Thomas of Cantimpré, Bonum universale de apibus (Liber de apibus), the behavior of bees allegorized as royal and clerical authority over human subjects. Two partial folios on vellum. Northern France or Flanders, ca. 1450: fol. 1: 219 mm x 176 mm (justification, 186 mm x 130 mm), single column, 34 lines (substantially the entire textblock); fol. 2: 216 mm x 147 mm (justification, 183 mm x 110 mm), single column, 33 lines (essentially missing a single line at top and 20 mm of text along the outer margin). Ruled in diluted ink. Decoration: fol. 1: one- and two-line miniated initials, initials tipped in red, some lemmas underlined in red, rubricated; fol. 2: initials tipped in red, some lemmas underlined in red. 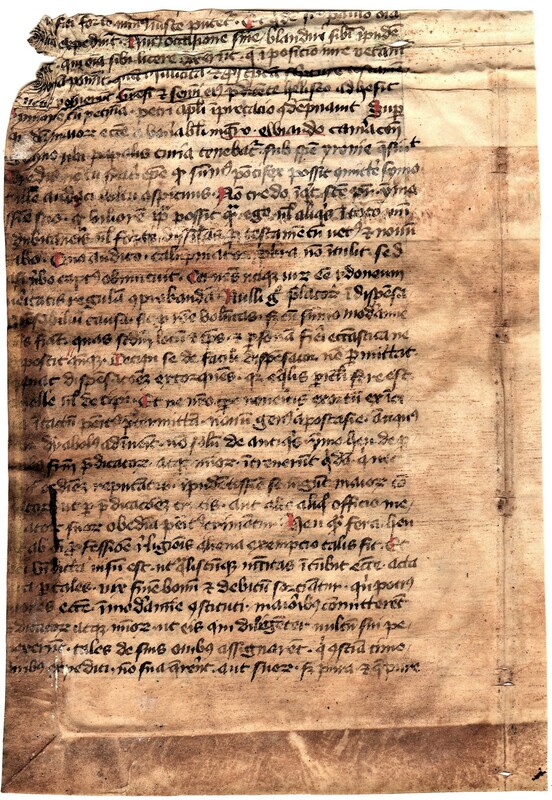 Text: Thomas of Cantimpré (d. 1272), a Dominican educated under Albertus Magnus in Cologne and later at the University of Paris, became a professor of theology at Leuven ca. 1240. His Bonum universale de apibus treated the habits of bees as an extended allegory of human organization under a clerical or lay ruler. The Liber de apibus considers the moral obligations of the weak and powerful in medieval political systems. 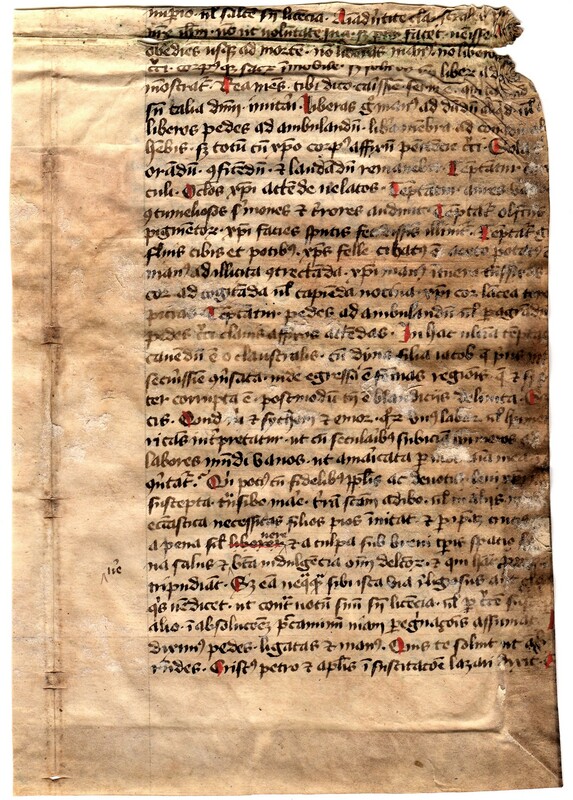 Contents: fol. 1: Book 2, cap. 8 (p. 153) usibus debeant …Book 2, cap. 10 (p. 157) qui relicta (on the value of hard work); Book 2, cap. 3 (p. 131) imperio optime … Book 2, cap. 3 (p. 135) pure que [que pure MS] (on the obedience of religious); see G. Colvener, Thomae Cantipratani … Bonum Universale de Apibus (Douai, 1627). 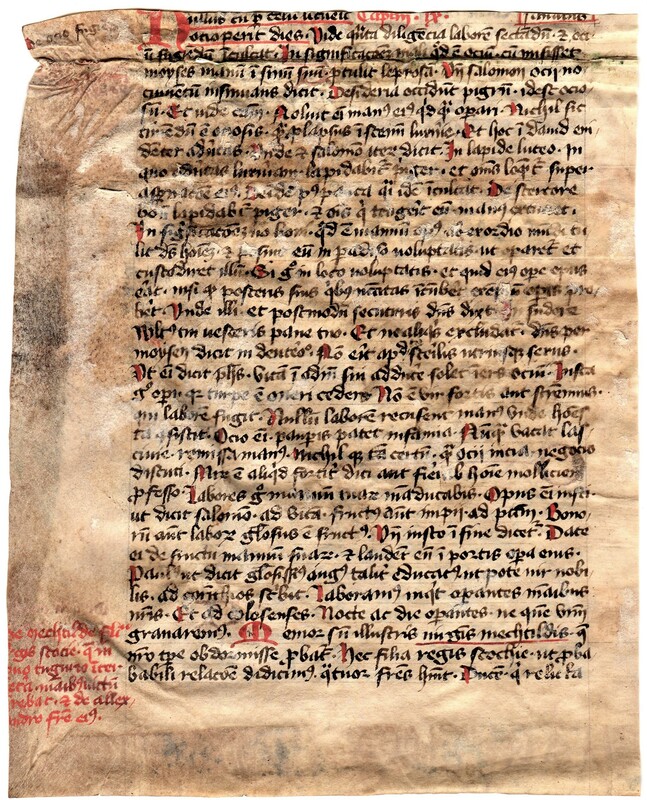 Provenance: from the paleography collection of J. P. Gumbert (d. 2016), Professor of Western Paleography and Codicology at the University of Leiden (sold Burgersdijk & Niermans, 15 November 2017 lot 1214). Condition: used as pastedowns, hence cut-down and worn as shown, small holes and losses; wrinked. 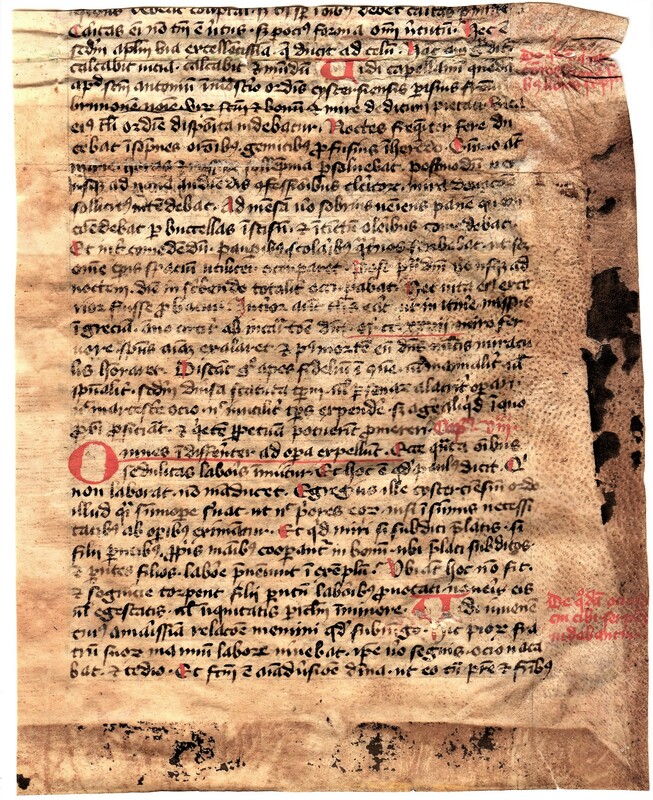 A rare text to find in fragment form.